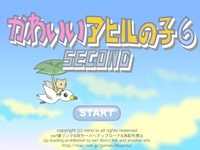 Minoto - Cute Duckling 6: Second is another Japanese point and click type adventure game developed by Minoto. In this game, you search around for finding items and solving puzzles. Enjoy the lovely graphics. Good luck and have fun! Can opener on can for cheese. Click birds to rescue mouse. Give cheese to mouse to get cosmetics. wow & yay, Minoto is back - LTNS! The best part of Minoto games were the Zoz sing-a-longs. If you've never read them, it's well worth it to go back. @Janet - Yup, as soon as I saw this I thought of zoz. Have good friends and play. The Witch and monkeys have all gone. We must help them get back home! To blow the Mad Scientist’s mind. As the Dart flies through the air. Face is burnt and so’s his hair. Her Parachute is all the rage. Tells Fire Fairy to come, too. The Lion scratches in the sand. So he can go poo. Will then do a dance so grand. On the stage she stirs the wind. So fast she makes the wind blow. She will dance up a Tornado! And take them back home to Kansas. But it ends on a good note! "don't expect anything when an old dev comes up with a new game after such a long time..."
But you're right: this game was a bit underwhelming. I also got really excited when I saw a new Minoto. And then let down (although I don't want to discourage the maker!). Thanks @Zoe for the trip down Minoto Memory Lane, and @Janet for the kind words! btw, I think the song for this one should be called, "You Can't Always Get What You Want". lol, zoz - Go for it! so i followed janet's and zoe's lead on zoz and wandered back through old games...they are brilliant...so far, my favorite...a father's travel 2011 to strauss's blue danube waltz. thank all three of you for the head's up and the entertainment...really funny. then persuade her to do one to monk's in walked bud. yes cate...lol blue danube...the beatles and rolling stones.. brilliant!! cate - lol!! would love that. they really are brilliant. thank you so for turning me on to them. Rut roh! I just checked in on comments; seems that Zoe and cate have been conspiring about me. I'll have to think on this. I'm not certain what cate has in mind regarding "proper entertainment and enthusiasm", and I'm intrigued by Zoe's deleted post. Anyway, I'm off to bed now! Looking forward to the zozasong. Apart from the crazy games with, as zoz called him, Uncle Comb-over, zoz's song-throughs made the whole thing even more hilarious. weirdness as weirdness can be! Minoto. I've so missed you. Thank you so much.